Newcastle is located 8 miles (12.9 km) northeast of Rocklin. It is nestled in the Sierra Nevada foothills, 31 miles northeast of Sacramento. Newcastle generally has moderate winters and warm summers. 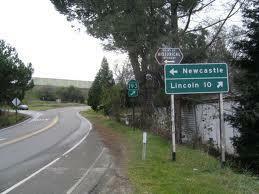 Newcastle was founded in the 19th century. 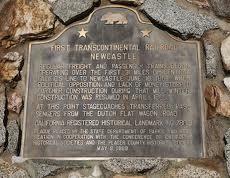 According to Transcontinental Railroad Landmarks the "Regular freight and passenger trains began operating over the first 31 miles of Central Pacific's line to Newcastle June 10, 1864, when political opposition and lack of money stopped further construction during that mild winter. Construction was resumed in April, 1865." The region is also in the vicinity of what was the cradle of "gold country", where in the mid-19th century a flurry of miners and gold prospectors searched for their fortune. During this time however, the town of Newcastle was known more for its orchards rather than abundant gold mines. The Newcastle post office opened in 1864.